A must-have for any pilot, the RocHobby Falcon 1220 is a cost-effective, performance civilian aircraft that oozes with character and individuality. With a bold, vibrant trim scheme and scale features to match, Falcon makes a unique statement at the flying field. The plane's eye-catching blue and red trim scheme features a soaring falcon on the side, giving the civilian aircraft a confident, sophisticated appearance. Other intricate scale features include operating CNC oleo-style retracts and a large cockpit with pilot. Plus, the Falcon can be assembled with just screws, meaning you can get it flying in no time. 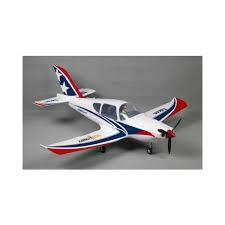 The plane's enhanced power system allows it to take off and land on water with ease - just add the optional float set.